This blog includes all the information you need for making your own homemade bread from Bread Making Supplies, bread starter recipes–to the final delicious produce. Enjoy! Most people have dogs, cats, and fish for pets. We have a starter. It is a fantastic, bubbling, probiotic-like, low-maintenance yeast that has been in my family for over 20 years. My dad received a sourdough bread starter from a friend and it has become part of our family. My kids have grown up with it, and it has been lovingly named “Papa Bread.”Like a pet, a starter has to be fed. So when the house sitter comes to check on the fish, walk the dog and water the plants, she’ll need to feed the starter once a week as well. It literally becomes routine and habit, growing into a tradition that smells like home. Instead of buying bread high in preservatives and low in nutrition and taste, learn to make your own. The smell alone will sell you, and the taste will have your guests asking for a bit of your starter to take home and recreate in their own kitchen. Many of our relatives, including my sister, SIL, MIL, aunt, and countless friends have starters of their own which originated from my dad’s starter of 20 years ago. We use this adored starter to make scrumptious bread for our everyday sandwiches, dinner rolls, dough for pizzas and calzones, cinnamon rolls, and even cookie cutter cut-out sandwiches. The possibilities are endless and the rewards are great. So you say you would like to make your own? No problem. First you will need starter. It’s easy to create, and it’s quite possible that it will be a treasure you can pass down for generations. Yeast is a naturally occurring microbe, so all you really need to make your own starter is some a little time, air, warmth, and starch. There are a number of ways to make your own starter. You can start a starter from whole-grains, such as rye and whole wheat, fruit, such as raisins or apples, or dry yeast. Do some experimenting of your own and see what works for you. Different starters can offer a variety of sourdough flavors to your baking. 1 c warm water 1/2 c sugar 1 package (2-1/4 teaspoons) dry yeast 3 T instant potato flakes, generic is fineCreating the starter can take a few weeks. Eventually, you want to maintain about four cups of liquid, so choose a container that is counter and refrigerator-friendly, with a lid that can be vented. A pitcher with a lid and spout that you can keep open works well. Mix starter ingredients in container. NOTE: ALWAYS leave lid vented, otherwise the container will build up gas and explode, trust me!!!
. Leave starter container on the counter to allow it to ferment for two days (Fruits will naturally ferment with no added yeast.). After two days, feed the starter with starter feeder (below). Repeat the starter feeding process for about a week until you achieve about 4 cups of starter. The starter will improve with time by gathering wild yeast from the air, making your bread more robust, ripe, and flavorful. Add water, sugar, and potato flakes to starter container and stir well. Let stand on counter at room temperature for 8-12 hours, (all day or overnight), then return to refrigerator with lid vented. Store starter in the refrigerator 3 to 7 days, then re-feed and leave on counter for the day or overnight. Repeat this process until you have four cups of starter.If you do not want to make bread, just mix well and pour out a cup of old starter (you can give it to a friend or just pour it down the drain) and feed it a cup of the new starter, leave it out for 12 hours, return it to the refrigerator for up to a week, then re-feed it, and so on and so on. Note: these whole grains are naturally coated with microorganisms that create excellent sourdough, more-so than all-purpose flour. Combine flour and water in glass or stainless steel container and mix well to combine. Cover loosely with a dish-cloth and leave in an area that is about 70 degrees (by a sunny window or on top of a refrigerator) for a day or so. After a day or so, stir the starter, discard half of it (or give it to a friend), and then add 1/2 c all-purpose flour and 1/2 c non-chlorinated water and let it remain at room temperature for about 2 days. On about the third day, you can feed the starter 1/2 c all-purpose flour and 1/2 c non-chlorinated water and let it remain at room temperature for about 12 hours. Feed daily for 2-4 days until starter becomes active and bubbly. After about a week of regular feedings you should be able to use the starter for bread. You will always want to reserve a cup or so of the ripe, well-fed starter in the container. 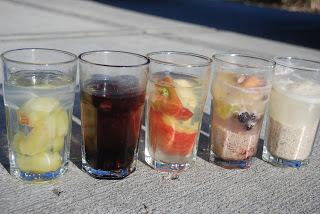 Combine fruit and water in glass or stainless steel container and mix well to combine. Cover loosely with a dish-cloth and leave in an area that is about 70 degrees (by a sunny window or on top of a refrigerator) for a day or so. Continue feeding the starter with flour and water, as mentioned in Whole-grain Starter, above. 4 cups King Arthur bread flour and 2 cups white whole wheat flour. Then add . . .
Add sugar, salt and warm water to large mixing bowl and stir to dissolve. Add other dry ingredients to mixing bowl, followed by starter and oil. Mix well and kneed. If bread dough is too sticky, add some flour. If bread is too dry, add some starter. Cover bowl loosely with lid. Let rise in warm location for about 12 hours (I let it rise overnight). After rise, punch down and knead for about 3 minutes, taking care to remove air bubbles. Spray baking pans with non-stick cooking spray. Note: Hamburger, hotdog bun and muffin-top pans work well for sandwiches, muffin tins work well for dinner rolls, pie pans work well for cinnamon rolls, and cookie sheets work well for pizzas and calzones. Divide dough evenly among pans. Let rise for 4-6 hours (pizza and calzone dough do not require rise. For pizza, spread dough evenly on cookie sheets using rolling pin, then bake for about 8 minutes, add sauce and toppings, then bake pizza for additional 8 minutes until golden brown). Baking times may vary depending on oven. I bake my hamburger buns at 400 convection for 15-18 minutes, my dad bakes his at 375 for 20 minutes. Remove from pans and allow to cool on cooling rack. When cool, slice buns with bread knife and serve or store in freezer bags in freezer to be enjoyed later. Enjoy! **Point of clarification: Papa Bread and Kristin Bread are made from the same recipe and starter, the difference is that I use more whole grains. My bread is more dense, which is why I add guar gum or gluten enhancer to help it rise. Pizza and calzone dough does not require second rise after placed in pan. For pizza, spread dough evenly on greased cookie sheets using rolling pin, then bake for about 8 minutes, add sauce and toppings, then bake pizza for additional 8 minutes golden brown. For calzone, spread thin layer of dough on cookie sheet, add toppings down the middle of the dough, then fold over right and left sides of dough. For decorative touch, you may make slits top with knife every inch or so. protein, such as beans, Daiya cheese, hummus, and nutritional yeast flakes. The possibilities are endlessly delicious! Enjoy! Roll out dough on floured counter top. Sprinkle cinnamon on dough, drizzle agave nectar, add raisins and crushed pecans, slivered almonds, crushed walnuts and/or pecans. Roll dough up “jelly roll” style. Use knife to cut in inch thick wheels to make in cinnamon rolls. Place cinnamon rolls in greased pie plate or in muffin or hamburger bun pans. Makes a great gift or treat. Enjoy! Artisan Baking, by Maggie Glezer, Creating your own sourdough starter: the path to great bread. | King Arthur Flour – Baking Banter and my awesome dad, Jim Misner! One of my favorite ways to enjoy freshly baked whole-grain sourdough bread is topped with peanut butter and hot pepper jelly-delish! Please remember that this is an art form as much as a science. Keep your expectations reasonable the first few times, and you’ll be a master in no time. After you make your own, please check back and let us know how it turned out! We want to hear your stories! If you have questions, we can help!